Scores of West Papuans are currently serving long prison sentences in terrible conditions simply for standing up for their right to freedom. 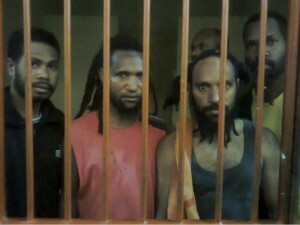 Sentences of up to 15 years have been handed out under the charge of “treason” simply for raising the West Papuan flag. Prisoners are kept in terrible conditions, are repeatedly tortured and continuously intimidated. Many have died without being allowed access to basic health care. Don’t leave these prisoners to be isolated and forgotten about. There is lots you can do to support them and campaign for their freedom. Please visit the excellent site Papuans behind bars. There you will find extensive information about the situation of prisoners in West Papua and a full list of prisoners. You will also find information on how you can write to prisoners, phone the prisons, and campaign for the release of prisoners.